Wanting to create cards that are a bit more mixed media that my regular cards I dug out my serendipity backgrounds stash and found two in blue, green and brown tones. These are a little less serendipity in that they feature square edged scraps instead of torn and are generally a little less layered and overlapping. They were embossed with an allover patterned embossing folder - Lattice (SU). I die cut a leaf (TH SX) out of one and a flower (SX) out of the other. Because these are the large dies that have three images on each die it required a bit of work. I have several broken plates for my Big Kick which I use to allow myself more flexibility when I am cutting and embossing. In the end, I broke one of my half plates in two to get two quarter plates so I could cut these where I wanted on them my background. It takes a bit of working out so that you can get the small plate positioned to cut only the one die. For the flower one I used brown heavy white core paper to cut another one and embossed it so that there was some swirls and a bird, sanded it a bit to reveal the white core and then added ink to help it coordinate with the background. I cut a dark yellow center as well which I dotted with a gold gel pen. I inserted the center into the flower and held it in place with regular tape and did the same with the flower into the background. 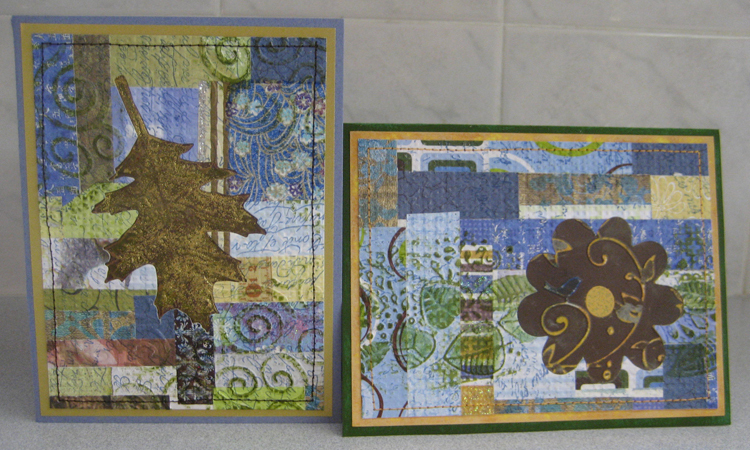 I used a border embossing folder to emboss the leaves on both sides and highlighted the embossing with green ink. I used a bit of watercolour afterwards to make some of the leaves more solid. For the leaf, I used the coordinating embossing folder to emboss brown cardstock with the leaf shape, added some colour and finally a bit of gold embossing powder to give the leaf added texture. I mounted the leaf behind the hole in my background and then used a swirl embossing folder (TH) with the small plates to emboss three of the corners which I highlighted with green ink as well. I layered these large elements onto coordinating layers (gold for the leaf and yellow for the flower) and then onto coordinating card fronts before machine stitching them all the way around. Very happy with how these turned out and they are headed to my partners in today's mail!! !